It didn’t take very long for the D.C United to get going on Wayne Rooney becoming part of the club. Today it took one more formal step, the intro to the media and a Declaration of Proclamation from D.C Mayor Muriel Bowser to give Rooney a true stars welcome to the city. 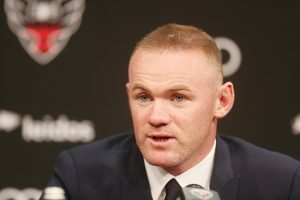 Rooney who practiced with the Elite team over the weekend to get him ready for the United game on July 14th and the opening of the new Audi Field was just part of the plan for Rooney. He was asked a little bit about his journey and why the United in particular. He left Manchester United after he had become peripheral there, but Rooney is determined to deliver success in the United States. “I’m not here to see out the last few years of my career, I’m here to compete, I’m here to win and that’s the way I’ve always played and will always play,” he said at his unveiling. “I’ve always set high targets. I demand a lot of myself and expect that from teammates as well. I have to adapt to however the club is run, and embrace it. The club has got great history. It’s been tough over the past few years and the club doesn’t need to look back at that history, it needs to create more history. “I made the decision to come here and I’m delighted to be here – I’m just looking forward to [my] first game. I’m sure there’s more players going to come in. We want to keep trying to build the team. It’s been a tough few years for the club but it’s moving in the right direction. Even with the United having one of the worst records in the MLS the past two seasons, the team has the right direction and he thinks the chemistry will be just right when the team returns from their road trip on Friday.